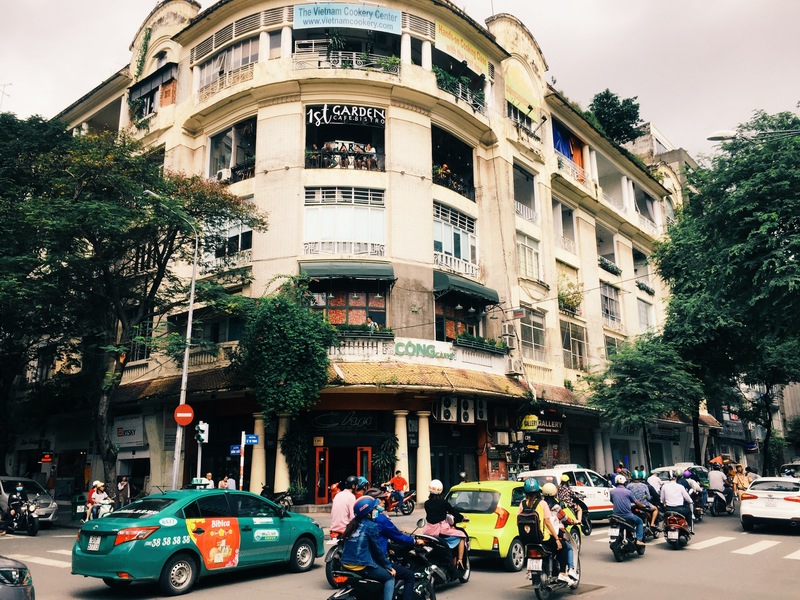 A corner of Dong Khoi street in the heart of Saigon. Ho Chi Minh City (aka Saigon) is one of the most vibrant cities in South East Asia and Vietnam’s largest commercial hub. Saigon is famous for its hustle and bustle lifestyle, exciting nightlife, amazing coffee and food culture. If you are travelling to Vietnam for the first time and looking for things to do in Saigon, following this guide will give you the best experiences the city has to offer. If you are arriving by plane, there are a few options to get to the city centre from Tan Son Nhat airport. The easiest option is to take a cab from the taxi ranks. The most popular taxi brands here are Vinasun Taxi (white and green) and Mai Linh Taxi (Green). The airport is only about 6km from city centre so make sure you do not spend more than 150.000 VND to get to District 1. 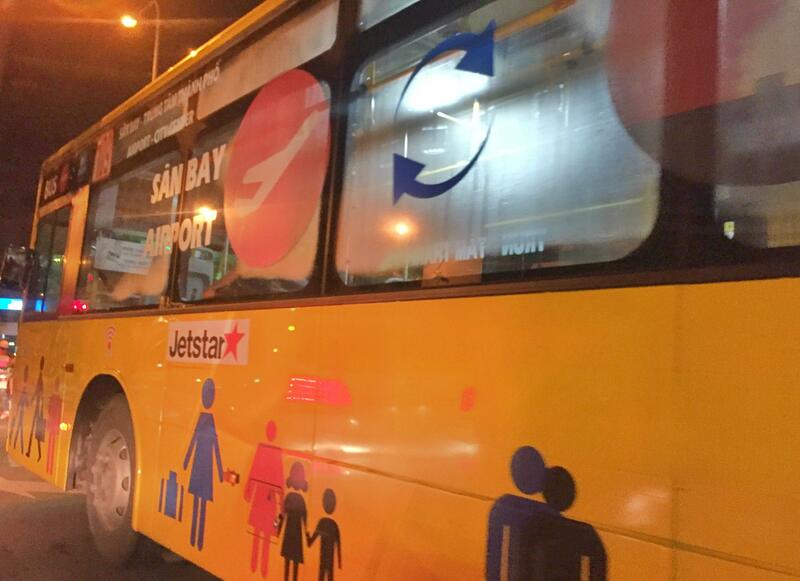 You can take a yellow shuttle bus in front of the terminal. Take route 109, which will drop you off right in front of Ben Thanh market and backpacking areas – the heart of the city. The fare per person is 20,000 VND (< $1 USD) which is very reasonable considering the bus is clean, new and leaves every 15 minutes. The best place to stay in Saigon is in District 1, as all the landmarks are located within the area. Popular hotels are easily found around the backpacking area, Bui Vien and Ben Thanh Market. Once you’ve dropped your bags and are settled, spend half a day exploring the city landmarks on a motorbike. Start with Ben Thanh market, where you can buy souvenirs and have a suit tailored. It’s advised that you to take care of your belongings here as the market is known for petty theft. In the event you are approached by street vendors in this area and you are not interested, just politely apologise and walk away. However, the vast majority of vendors are in good humour and more than happy to accommodate your haggling. There are about 8.5 million motorbikes in Saigon, making crossing the streets is the most interesting and intimidating thing to do. If you’re feeling adventurous, try crossing the street at the busy intersections around the market. The secret is to keep walking straight and let the motorbikes avoid you. Be brave, or you could be spending a lot of your visit on the sidewalk watching the traffic blow by! From Ben Thanh market, walk along Le Thanh Ton street to visit Dong Khoi, a high-end fashion boutique street and the Saigon opera house. 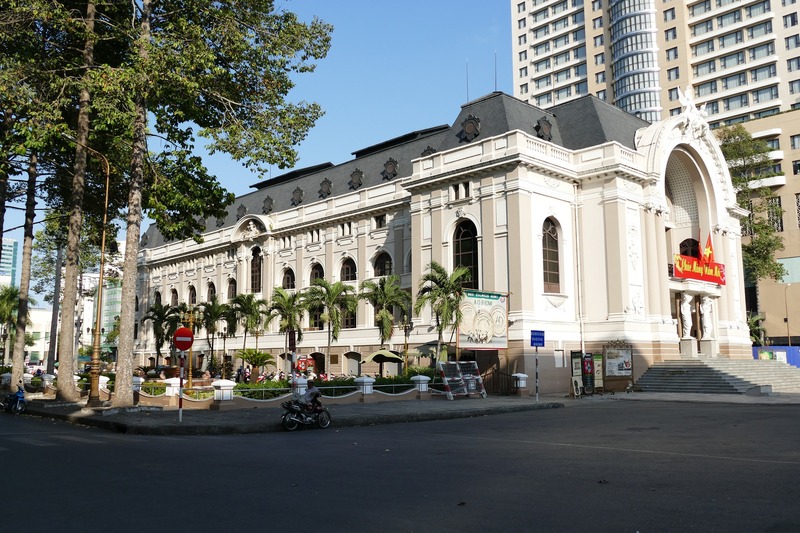 Built in 1897 by the French, the Saigon opera house used to be the home of Lower House assembly of South Vietnam government. From the opera house, you can turn right to the Nguyen Hue walking street and City Town Hall. 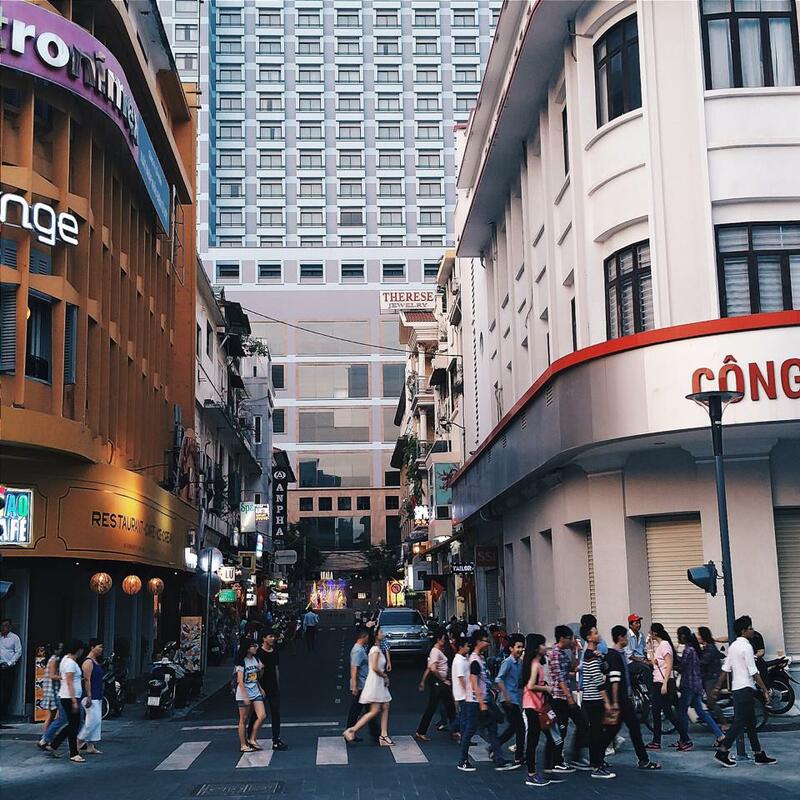 The walking street is home to many good coffee shops and restaurants and makes for a great photo with its wide open space. 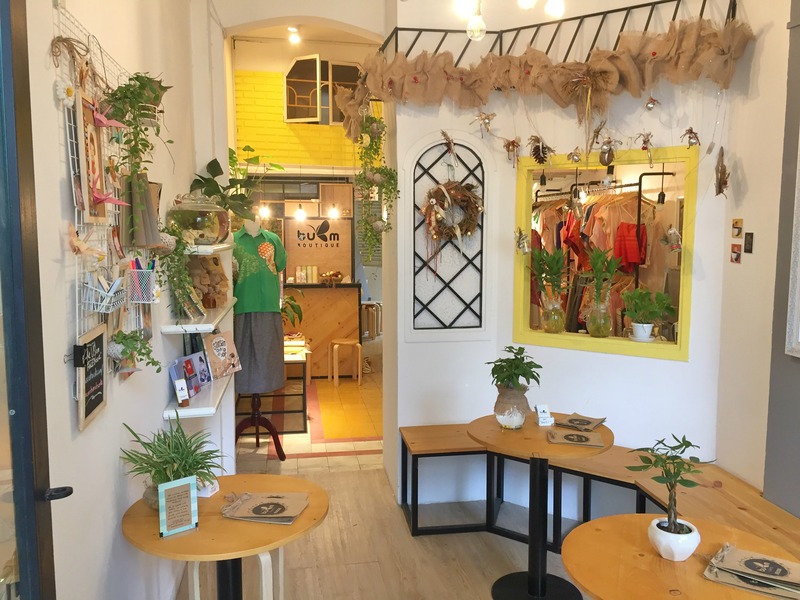 Try the hidden café apartment on 42 Nguyen Hue, where you can explore many great coffee and fashion boutique shops hidden in a run-down building. A fashion boutique store inside the coffee apartment on Nguyen Hue walking street. Direction to different coffee shops inside the coffee apartment building on Nguyen Hue street. From there, head to the Notre Dame Cathedral and Central Post Office, both built during the French colonial period. The Notre Dame Cathedral is a replica of the one in Paris, and the Central Post Office still functions as one! You’ll be able to buy a postcard from the surrounding kiosks, and the Book Street right next to the post office. 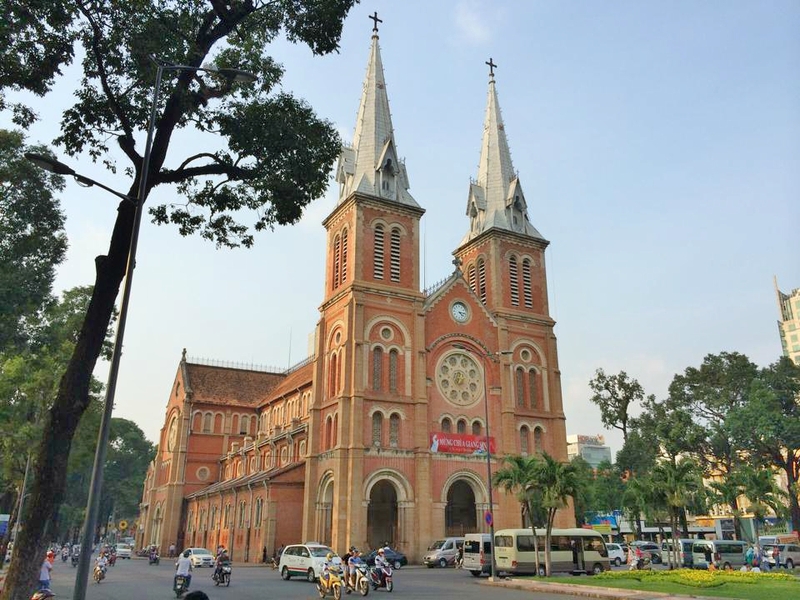 Notre Dame cathedral, built in 1863, is one of the most iconic landmarks in Saigon. The map of Indochina (Vietnam, Laos and Cambodia) inside Saigon’s central post office. A glimpse of the Reunification Palace from the front gate. If you are into Vietnamese War history, the Reunification Palace (former South Vietnam parliament house) and the War Museum are both just a short stroll away. These museums offer travellers a stark glimpse into the realities of the Vietnam War, which prove to be both fascinating and eye-opening at the same time. Visiting Saigon’s hidden war sites is highly recommended if you are interested in looking at the Vietnamese war from a new perspective. 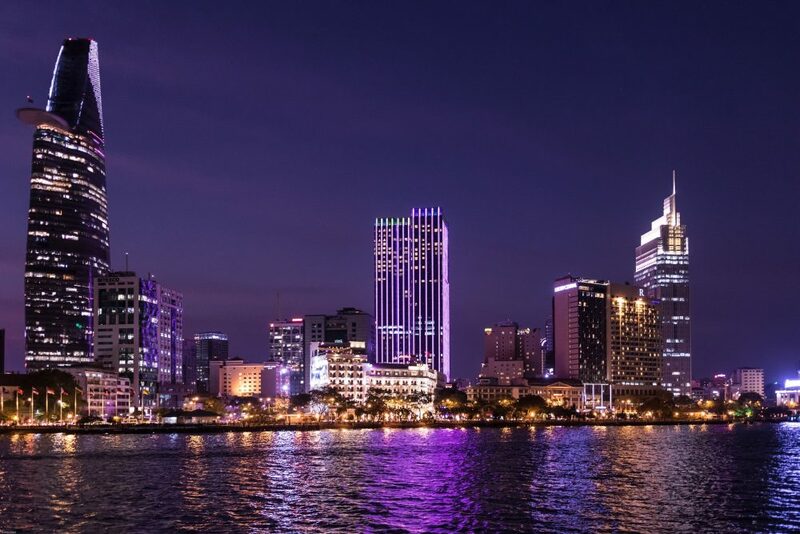 In the evening, take advantage of Saigon’s reputation for the best nightlife in Vietnam. You can kick off your night wandering around Ben Thanh night market where street vendors offer a wide range of goods- from dried foods to suit cases. Sunset from Broma bar looking over to the walking street Nguyen Hue. After this, its time to check out the skyline, which at night time is a beautiful sight. Rooftop bars are becoming more and more popular in Saigon, and as evening falls the city light show comes alive. Local favourites include Glow Bar (corner Nguyen Du and Pasteur street), Chill Sky Bar (on 76 Le Lai), Broma (41 Nguyen Hue) and Hotel Des Arts (on 76 Nguyen Thi Minh Khai). The best time of the day to visit these rooftop bars is at around 6 pm, when you can watch the sunset and look down to the busy streets below. Glow Sky bar has one of the best city views. If you are a fan of live music, try Acoustics Bar (6E Ngo Thoi Nhiem). This local favourite is hidden at the end of an alleyway but offers a cosy local atmosphere. If you are a fan of Jazz, Sax n Art (28 Le Loi) has the best music in town. The world famous saxophonist Tran Manh Tuan play here occasionally if you’re lucky enough. Acoustic Bar is an open mic bar where local talents and guest singers looking to make a name for themselves. Looking for a cheap night out? 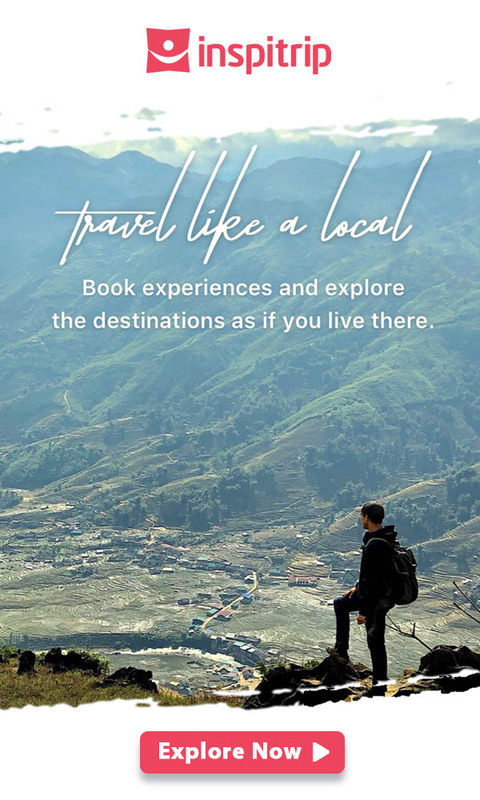 You can head to Pham Ngu Lao and Bui Vien street which are backpacker areas, where you can easily hang out with fellow travellers or meet up with local people while enjoying the cheapest beer in the world. You cannot leave Saigon without experiencing its great coffee culture. Exploring and finding new exciting coffee shops is a hobby for many locals. Coffee shops in Saigon compete with each other not only on their menus but also on their originality and uniqueness. The coffee apartment on the corner of Ly Tu Trong and Dong Khoi Street. Many of the coffee shops are hidden in run down buildings built from the French colonial era, which gives you even more reason to have a look around! L’usine cafe (151 Dong Khoi and 70 Le Loi) is a small French boutique coffee shop with an attached gallery and fashion boutique hidden in an old loft which makes it a great spot for relaxing, brunching and dining. The building at 26 Ly Tu Trong offers a similar experience. Once inside the building, try Loft café on 1st floor, Cong on 2nd floor and walk around to explore small boutique shops and art galleries. ID café on 34 Thu Khoa Huan (behind Ben Thanh Market) is another great cafe to try. The ambience here brings back the memory of an old Saigon making you feel being lost touch with the hustle & bustle environment outside. 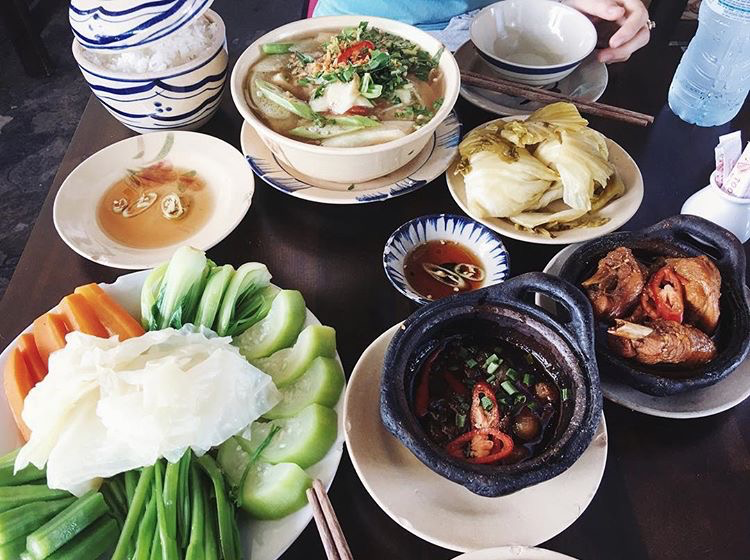 Great food plays a big part in Saigonese life. If you are craving a hot bowl of Pho noodle soup, Pho Hoa on 260 Pasteur Street is the best place to be. Unchanged over the past half century, this pho restaurant is revered for its high-quality beef, large portions, and fast service. Pho Hoa on Pasteur street has been the same location over 50 years and has no branch. Towards the other end of Pasteur Street at number 158, the Secret Garden restaurant is hidden on top of a crumbling building. A great find for Vietnamese food seekers, the yummy cuisine and countryside atmosphere makes the five storey climb to get here worth it. Traditional Vietnamese food served at Secret Garden. Another highly recommended restaurant for authentic Vietnamese food is Cuc Gach restaurant on 10 Dang Dung. The restaurant brings you back to a traditional Vietnamese country style with its clever design and menu. 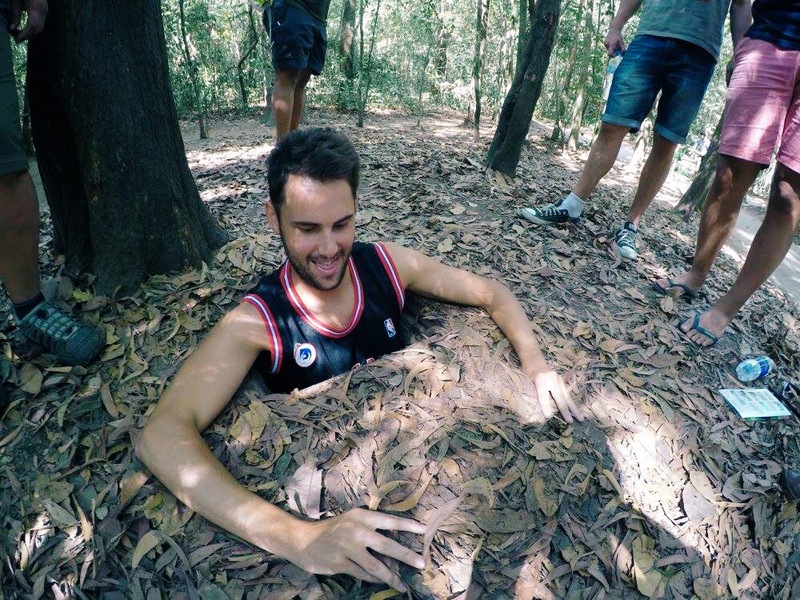 While you’re in Ho Chi Minh City, don’t forget to spend half a day to visit the Cu Chi tunnels. Located about 50km from the city centre, Cu Chi tunnels are a network of connected underground tunnels used by the Viet Cong as hiding spots during the Vietnam War. Don’t forget to test your shooting skills at the range inside Cu Chi tunnel. This is a real eye opening experience that allows you to grasp a completely new perspective on the Vietnam war. It also displays the resilience and ingenuity of the Vietnamese people, and all the crazy methods they came up with in an attempt to stop the Americans. If you are brave enough you can go down into the tiny tunnels and get a feel for what it would be like to live in these conditions, not for the faint hearted! 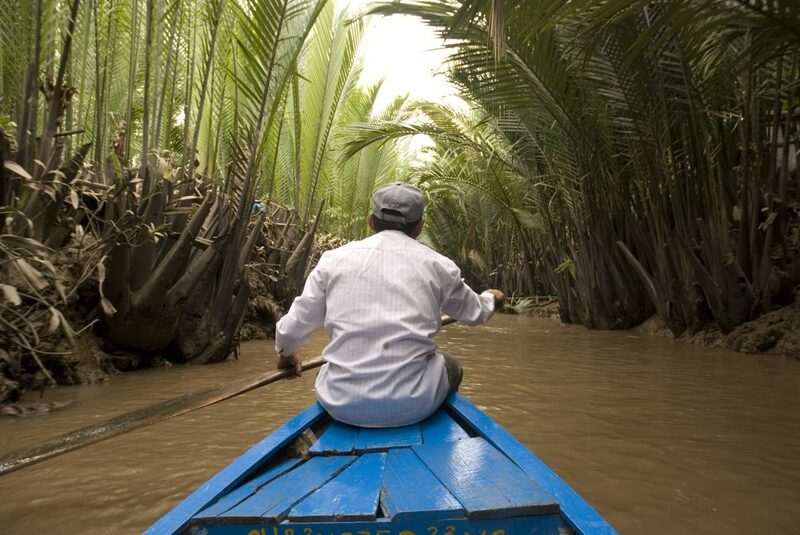 Before leaving Saigon, don’t forget to spend half a day meandering down the sleepy Mekong Delta, marvelling at the towering mangroves and getting a real sense of the southern region of Vietnam. If the pace of life in HCMC is on fast forward then in the Mekong it is on slo-mo. The Mekong until recent history, was part of the Khmer dynasty hence exhibits a culture quite distinct from the rest of Vietnam.